As the 2012 party conventions approach, the Democratic Party continues to maintain an advantage in party identification among voters, but its lead is much smaller than it was in 2008. In more than 13,000 interviews conducted so far in 2012, 35% of registered voters identify with the Democratic Party, 28% with the Republican Party and 33% as independents. The share of Democrats has fallen three points since 2008, while the proportion of Republicans has remained steady. When the leanings of independent voters are taken into account, the closing of the Democratic advantage is even more noticeable. Currently, independents lean slightly more toward the Republican Party than the Democratic Party (15% vs. 13%). Four years ago, the reverse was true (13% leaned Democratic, 11% Republican). Overall, the Democrats now have a five-point lead in party affiliation among registered voters when independents who lean to either party are included (48% to 43%). That is down from a 12-point advantage in 2008 (51% to 39%). The current Democratic edge in leaned party identification is comparable to the slim leads they held in 2004 (three points) and 2000 (four points). For a detailed analysis of recent trends in party identification, the composition of the parties and the opinions and values of Republicans and Democrats, see the accompanying tables. Over the past four years, the shift in party identification has occurred almost entirely among white voters. The Republican Party now has a 12-point advantage over Democrats among non-Hispanic white voters: 52% identify with or lean toward the Republican Party while 40% identify with the Democratic Party or lean Democratic. 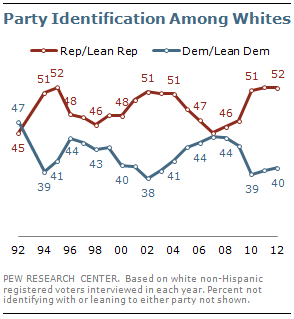 In 2008, the balance of party identification among whites was almost evenly divided (46% Republican vs. 44% Democrat). The Democratic Party’s advantage among blacks and Hispanics, by comparison, has remained largely unchanged. The Republican Party’s current lead among white voters is not unprecedented – their advantage is on par with the GOP’s lead among whites from 2002-2004 and from 1994-1995. And all of the GOP gain among whites over the past four years is in leaning among independents. In other words, whites are no more likely to call themselves Republicans today than in 2008 (34% in both years), but they are more likely to lean Republican (17% today, up from 12% in 2008). The Republican Party’s gains among whites cross many demographic subgroups. The GOP lead among white men has doubled from 11 points in 2008 (51% Republican or lean Republican vs. 40% Democrat/lean Democratic) to 22 points (57% vs. 35%). And white women, who leaned Democratic by a 49% to 42% margin in 2008, now tilt slightly toward the GOP by a 47% to 44% margin. The two parties now run even among white voters younger than 30, while Republicans have the advantage among all other age groups. Lower-income and less educated whites also have shifted substantially toward the Republican Party since 2008. The GOP has largely erased the wide lead Democrats had among white voters with family incomes less than $30,000. And middle-income whites ($30,000-$74,999), who were split between the parties four years ago, now favor the GOP by 17 points. By contrast, there has been no shift among higher income whites, who favor the GOP by roughly the same margin today as in 2008. Similarly, whites without a college degree now tilt decidedly toward the Republican Party – the GOP now holds a 54% to 37% advantage among non-college whites, who were split about evenly four years ago. The partisanship of white college graduates, by contrast, has not changed. The Democratic Party continues to have a wide lead in party identification among Millennials, voters born after 1980. Currently 55% of Millennials identify with or lean to the Democratic Party, compared with 36% who identify or lean to the Republican Party. 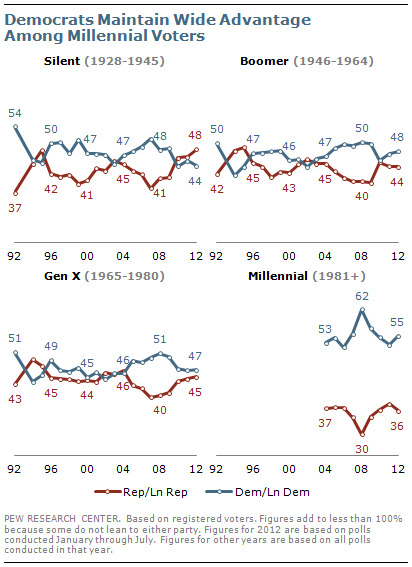 However, the Democrats’ advantage among Millennial voters has declined from 32 points in 2008 to 19 points today. The balance of party identification is more evenly divided among other generations. Republicans have a four-point advantage among voters in the Silent Generation, while Democrats have an equivalent lead among Baby Boomers. Generation X is evenly divided (47% Democrat vs. 45% Republican). The demographic differences between the Republican and Democratic voters are reflected in current profiles of the two parties’ bases. In surveys conducted in 2012, nearly nine-in-ten (87%) Republican and Republican-leaning registered voters are white, while just 11% are minorities. In contrast, 61% of Democrats are white, while nearly four-in-ten are African American (21%), Hispanic (10%) or another race (7%). Men make up a majority (52%) of Republican Republican-leaning voters; among Democratic voters, 43% are men while 57% are women. Republican and Republican-leaning voters also are far more likely than Democratic voters to be married (65% of Republicans vs. 49% of Democrats). Click here to see detailed tables showing trends in party affiliation, the demographic composition of the parties, and the opinions and values of Republicans and Democrats.